Everyone’s got a definition for what they think steampunk is. Jake Von Slatt, one of the most prominent members of the movement, describes it as “…essentially the intersection of technology and romance.” Author Caitlin Kittredge says, “It’s sort of Victorian-industrial, but with more whimsy and fewer orphans”. I’ve heard people attempt to explain it as “what would have been if H.G. Wells and Jules Verne ruled the world” or simply, “Victorian-style science fiction”. When those definitions of steampunk fail to bring understanding to the average person who asks me what genre I write in, I usually tell them to think of the Wild Wild West TV show/movie or League of Extraordinary Gentlemen. I remember attending my first steampunk convention a few years ago. Like many new inductees to this fun genre and culture movement, it wasn’t until I saw people dressed as members of Victorian society or attended panels by authors such as Cherie Priest and Genevieve Valentine that I realized what I enjoyed reading and seeing in movies had a name. Before long, I was hooked on the aesthetic and the wellspring of functional and artistic creativity that steampunk offered. I channeled them into my chosen outlet. 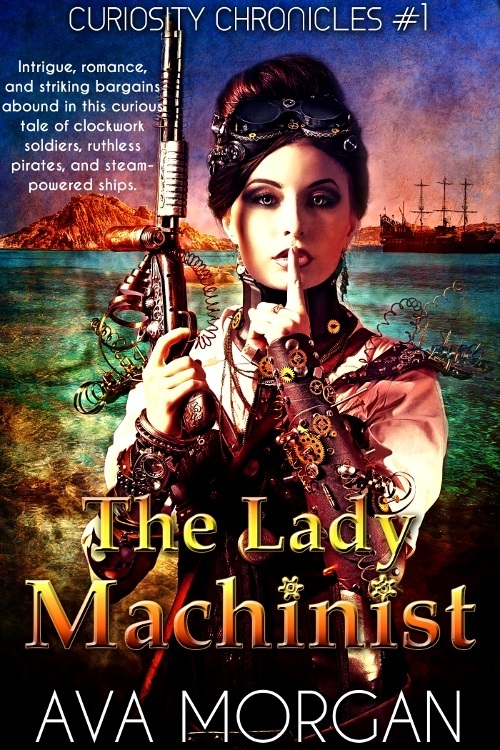 My ebook THE LADY MACHINIST came as a result. As with any genre fiction, steampunk is constantly evolving. Although it can be classified as a “soft”, or sociological, form of science fiction, authors have added elements of it to other genres such as fantasy, historical mystery, and romance. How much or how little steampunk to place in your story is pretty much up to you. Here’s what I’ve come to learn in my writing. 1. Use reality to help readers suspend their disbelief. Sounds oxymoronic, doesn’t it? If steampunk incorporates hypothetical Victorian inventions such as airships, ray guns, and clockwork dolls, why would you want to bother with putting ordinary details of life in your story? Simple. It helps the reader accept that the impossible can occur in an everyday world, even while your character is doing the mundane task of washing the dishes. For example, if your story takes place in a nineteenth-century Victorian setting here on Earth, try having your characters acknowledge or respond to an event that actually occurred at the time. My setting year for THE LADY MACHINIST is 1837. A quick Google search will tell you that in that year, Queen Victoria reigned over England. I kept that fact in my story. Even though a large portion of it takes place on a fictional Mediterranean island called Aspasia, the population there knows of a certain young British queen who recently took the throne. They also know of the rivalry going on between that queen’s burgeoning empire and that of France. It is because of that rivalry that the story’s protagonist, automaton inventor Lydia Dimosthenis, refuses to sell her work to the British for concern of keeping her country neutral of international affairs. So, despite there being seven-foot tall, hydraulic steam-powered automatons running around an island, I’ve maintained some basis of reality by incorporating a bit of historical truth in acknowledging Queen Victoria as monarch. You can do the same with a steampunk setting that takes place in a different world than ours. Create a society as you see fit, but keep true to your established rules. If you have factories churning smoke on a distant planet, explain why that society values or needs industry. If your character is the captain of a submarine, state why she is traveling underwater. We all do things for a reason. The more realistically your characters react and live in their world, the more likely readers will accept your chosen steampunk elements. 2. Be sensitive to cultural issues, past and present. We know that not everything in Victorian society was acceptable by today’s standards. Atrocities such as slavery and child labor were seen as simple factors of life. Imperialism was also the norm. You may come across these issues in your own writing, and have to decide how much attention you’re going to give them. I’m not saying to turn your steampunk story into a revisionist cultural dissertation or not write about people living outside of Europe. By all means, your story can have steampunk samurai or Masai warriors. With that being said, proceed carefully in how you represent nations and/or cultures that are different from your own. Do as much research as your story needs. Visit websites and read blogs from those discussing the multicultural aspects of steampunk. Ask questions, because without proper understanding, it’s very easy to write clichés or characters that come off as stereotypical and offensive. Remember, one of the best things about steampunk is that it appeals to so many people of all ethnicities and nationalities. 3. Finally, don’t go overboard on the steampunk buffet. As with everything else I’ve said in this post, this is just my opinion, so take it with a grain of the proverbial salt. I compare the steampunk genre to a well-stocked refrigerator. There are so many great and delectable things it holds, but that doesn’t mean all of them should go into the stew. Yes, there are airships, steam engines, windup cancan dancers, krakens, aether ray guns, and so forth, but unless you have a very good reason for including all of these elements into one story, it might come across as being overly broad and scattered. If you’re new to steampunk, it’s probably a good idea to pick and choose what aspects you want to touch upon in your writing. I know that as a creative type, I get excited at the prospect of writing a story where anything goes if I want it to, and I can load my characters up with all kinds of goggles, gears, and whatnot. But I have to reign it in and remind myself that my characters are supposed to have a purpose in my fictional little steampunk world. If I’ve set it up where airship travel is very new (as I have in the upcoming works of my Curiosity Chronicles series), then it doesn’t make sense for everyone to be walking down the street dressed in aviator caps and bomber jackets. These basic points are the guidelines I use for my stories. As I continue to learn and as the steampunk movement steadily grows, I’ll reexamine them. But if you find them helpful (or not), let me know. You can find me at my website at www.avamorgan.com or follow me on Twitter and Facebook. Love to hear from you! If you have enjoyed this piece please do comment below. We would love to hear from you. Thanks, Nicholas! I agree. Steampunk is becoming very prominent in mainstream culture. I see its influences in fashion, movies, and comics, just to name a few mediums. With its showcase of steam technology and exposed clockwork and engine parts, it’s a perfect setting for post-apocalyptic situations. The genre hints at a world on the brink of evolutionary progress or destruction, depending on how that technology is used. Thanks for commenting! Loved this article. Thought about trying my hand at steampunk for a while, and after reading this I think I’ll have a go at a short story. Great advice about not going overboard as well. I’m inspired! Thanks, Steve! Glad the article provided you with inspiration. Have fun writing your short story!